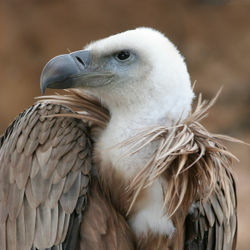 A particular characteristic of many vultures is a bald head, devoid of feathers. This is likely because a feathered head would become spattered with blood and other fluids, and thus be difficult to keep clean. This feature also allows quick cleaning in a nearby river. Vultures fall into two groups. The Old World vultures found in Africa, Asia and Europe belong to the family Accipitridae, which also includes eagles, kites, buzzards and hawks. They find carcasses exclusively by sight. New World vultures and condors are not at all closely related to the superficially similar Accipitridae, but belong in the family Cathartidae, which is quite close to the storks. Several species have a good sense of smell, unusual for raptors. The similarities between the two groups are due to convergent evolution rather than a close relationship. A group of vultures is occasionally called a venue. When circling in the air, a group of vultures is called a kettle. Vulture seldom attack a healthy living animal, but may kill the wounded or sick. Vast numbers have been seen upon battlefields. They gorge themselves when prey is abundant, till their crop forms a projection, and sit, sleepy or half torpid, to digest their food. They do not carry food to their young in their claws, but disgorge it from the crop. These birds are of great value as scavengers, especially in hot regions. The vulture population in India has declined by up to 95% recently and two or three of the species of vulture in South Asia are nearing extinction. The cause was found to be due to the practice of giving working animals the non-steroidal anti-inflammatory drug ( NSAID) diclofenac, which has a pain killing action. Diclofenac administration keeps animals that are ill or in pain working on the land for longer. Diclofenac accumulates in the animals' bodies; when the ill animals die, their carcasses will still contain the diclofenac. Farmers leave the dead animals out in the open, relying on vultures to tidy up. Diclofenac present in carcasses it also eaten by the vultures, but unfortunately vultures are very sensitive to diclofenac and suffer kidney failure and death as a result of diclofenac poisoning. The decline has led to general hygiene problems in India as carcasses of dead animals now tend to rot, or be eaten by rats or wild dogs, rather than be tidied up by vultures. In addition, there are particular problems for certain human communities, such as the Parsi, that have sky burials where the human dead are put on the top of Towers of Silence where vultures eat and clean the bodies and leave only dry bones. Meloxicam – another NSAID similar to diclofenac – has been found to be harmless to vultures and should prove to be an acceptable alternative. The Government of India has banned diclofenac, but it continues to be sold over a year later. was the uniliteral used for the glottal sound (3) including words such as mother, prosperous, grandmother, and ruler. In contrast to many other birds of prey, vultures have often been considered repulsive in Western culture, due to their association with death. Sensationalistic journalists looking for news about bloody crimes are sometimes called "vultures". Financial investors who look for indebted companies or countries to buy securities at low prices are known as vulture funds. Lawyers who profit off death, such as inheritance, wrongful death, or life insurance lawyers, may also be called "vultures". A prominent Spider-Man supervillain is known as the Vulture.